The Wolf pAX2 kit is designed to be an one kit system for outdoor use. 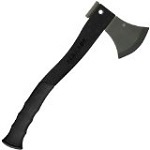 The Hatchet is awesome, and can do anything and everything you would want a small hatchet to do. The Wolf Pup knife is able to do all the smaller finer task without any problem it is just not my favorite in the neck knife range of knives. Overall I am very happy with this set and will be using it on a regular bases for all my bushcraft tasks.